News has reached us from various sources concerning printing dates and cylinder numbers on Machin and country definitives. 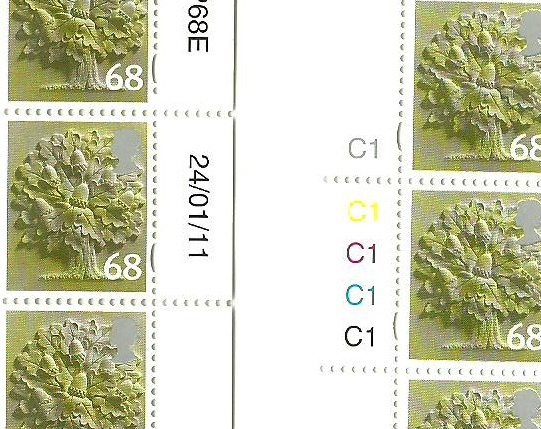 The England £1.10 stamp is, of course, printed in two columns alongside 2 columns of 68p stamps, so that value will also exist with the new date and cylinder number. 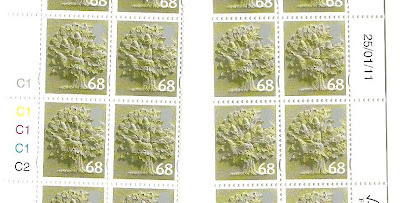 The Scotland 68p stamp exists dated 27/01/11 with black cylinder C2; once again this indicates that the £1.10 should also exists in this form - the Scotland £1.10 has now been seen. 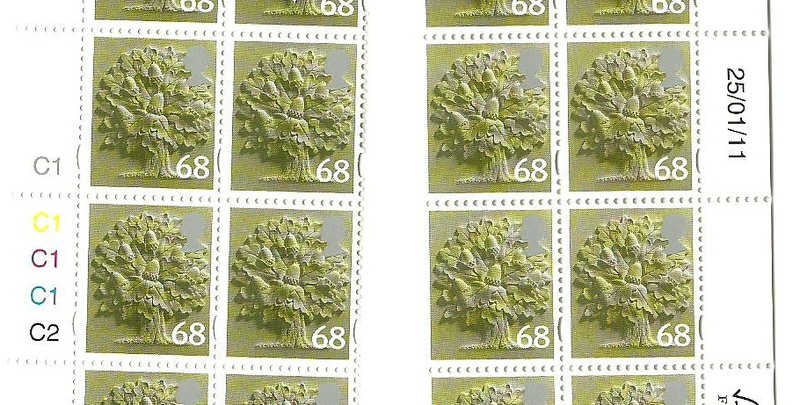 Although the low-value self-adhesive stamps were printed in January this year, some printings for the stamps with ordinary gum may not have appeared in post offices yet - and Royal Mail said that stocks of gummed stamps will be exhausted before the self-adhesives are sent to POs. A late printing of the 20p emerald has appeared - 15/09/10 - with a D5 cylinder number, replacing the D4 printed on 10/03/08. Will we lose gold in Olympic year? Back in 1997 the colour of the 1st class stamp changed to gold in honour of the Queen's Golden Wedding Anniversary. They reverted back to orange, and then there was the Millennium version, and in 2002 the colour again changed to gold coincident with the Queen's Golden Jubilee - and it has remained gold ever since. When two or three collectors get together discussing modern developments in stamps, all sorts of speculative thoughts are voiced. The Diamond Jubilee occurs next year and Royal Mail have already announced the issue of a new definitive in February, replacing the current gold one, but no details have yet been supplied. It's been suggested that there will be no point in reverting to gold at the end of 2012: so it is more than possible that the Diamond Jubilee 1st class definitive will be the default - in counter sheets, business sheets, retail booklets, prestige stamp books and coils. It's logical that the Large Letter stamp will also change from gold. Anyone want to guess what the change will be? Bright silver for diamonds? Royal Purple? 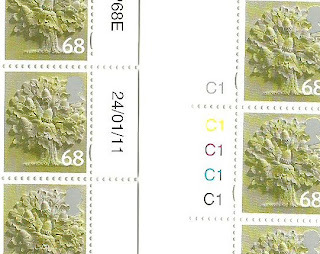 Colour with a silver security overprint (seems unlikely, they still think this is a secret security device!)? And if there are no more gold stamps, will the Arnold Machin Centenary sheet hold the last printing of gold 1st class stamps? Your speculation is invited - use the comment box! If I was looking for design inspiration for the diamond jubilee stamp I'd look no further than the George VI 8d stamp. I'd be happy with the colour too. Oddly I saw one for sale on eBay the other day with the shape described as a pentagon - which has 5 sides. The KG VI 7d/8d stamp design has a hexagram as the centre frame - with 6 sides.